Tim Waggoner is a novelist and college professor. His original novels include the Nekropolis series,Cross County, Darkness Wakes, Pandora Drive, and Like Death. His tie-in novels include The Lady Ruin series and the Blade of the Flame trilogy, both for Wizards of the Coast. He’s also written fiction based on Stargate: SG-1, Doctor Who, A Nightmare on Elm Street, the videogame Defender, Xena the Warrior Princess, and others. He’s published over one hundred short stories, some of which are collected in Broken Shadows and All Too Surreal. His articles on writing have appeared in Writer’s Digest, Writers’ Journal and other publications. Hi! Thanks for agreeing to do the interview. 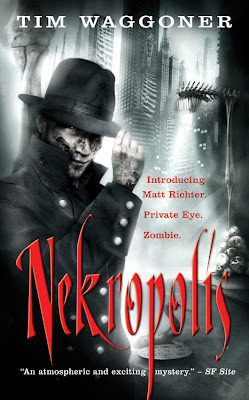 First off, let's start with your latest novel from Angry Robot Books, Nekropolis. How did Angry Robot Books end up publishing that series? I’d worked with publisher Marc Gascoigne when I wrote A Nightmare on Elm Street: Protégé for Black Flame Books. When Marc moved on to create Angry Robot Books, he sent me an e-mail asking if I had any projects that I wanted to pitch for him. It so happened that I’d been looking for a mass-market publisher to bring out Nekropolis for a while, and the rest, as they say, is history. Marc loved the original book, but he asked me to add about 25,000 words of new material to flesh out the world more, which I did. The plot is essentially the same as the original novel, but hopefully it’s a more enjoyable reading experience now. I know I had a hell of lot of fun writing the new material! What made you decide to fuse elements of the private investigator, humor, and horror into one book? Like a lot of writers of my generation, I grew up in a cultural mix-master of different influences – comics, TV, movies, novels . . . I loved any kind of storytelling that fed my ever-ravenous imagination. In some ways, I’d say comics probably influenced me the most. You could read an issue of Spider-man and it would be a straight superhero story, but the next issue might feature a mystery, and the one after might be more like a horror tale. Seeing all these different elements came into play in the same series showed me the narrative possibilities of combining various genre elements. 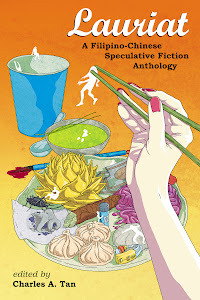 Where there any challenges expanding the novella into a full-blown novel? Since I wrote the original novella almost fifteen years ago, returning to the story to expand it meant that I needed to refamiliarize myself with both the world and the character’s voice, since it’s written in first person. I’ve grown as a writer over the years, so I needed to edit the original material which, while not terribly written, needed some polishing. Otherwise, it was a smooth revision. Nekropolis is my favorite of all the worlds I’ve created, and in many ways, I’ve never left it since writing the original version. The revision was like visiting an old friend you haven’t seen in a while. Moving on to writing in general, what made you decide to write fantasy, science fiction, and horror? There was no real decision to it. The kind of books and movies I’ve always sought out are those that stimulate my imagination. Mainstream stories – those that take place in the real world featuring realistic characters doing mundane things – bore me. I live in the real world. I know it. I want to read – and write – about places where the imaginative possibilities are broader than in our world. What was the biggest hurdle you had to overcome before getting published? Learning to write at a publishable level was the biggest hurdle because it takes a while to become good at anything. Writing is often done on your own, with minimal feedback, and it’s difficult to get feedback from publishing professionals because they’re busy doing their own writing. A lot of the teachers who teach writing classes aren’t writing at a professional level yet (and maybe never will), which is WHY they teach. So I slogged along on my own for years, taking a few classes here and there, submitting work and getting rejected by editors, until finally, in my late twenties I began to sell regularly. Pros often speak of persistence being the most important quality that new writers need, and if it’s not the most vital quality, it’s up there. Since you teach Creative Writing at Sinclair Community College, how has the teaching aspect of your life affected you as a writer? In my case, writing professionally informs my teaching, as you might imagine, but people are often surprised to learn that it works both ways. The act of trying to understand how I do what I do, and how I can help beginning writers do it too sharpens my own understanding of how fiction works and that awareness plugs back into my own writing. It’s a wonderful cyclical process that I hope will continue throughout my career. Though it can be a bit of a challenge to get writing done when I’m grading stacks of papers. You also wrote some media tie-in novels. What are the challenges when it comes to writing in such a field? Which are you more comfortable with, original fiction or media tie-ins? In generally, I’m equally comfortable writing original work and tie-in work, though truthfully I’m beginning to get a bit tired of the latter. The fun challenges of tie-in work are trying to capture the feel of the world you’re writing in, and to get the voices of the characters down, if you’re using already established characters, as I did in one of my latest tie-in projects, a Stargate novel. The not-so-fun challenge for me is that I’m hemmed in by already existing parameters of the property, so I can’t let my imagination have full reign. As the years go by, I’m finally this constriction to be more difficult to deal with, and I’m considering doing fewer tie-ins in the future. Right now I have two more tie-in novels left to do on a contract for Wizards of the Coast. After that, we’ll see. A couple of your media tie-ins are gaming related. Are you a gamer? What games do you play? I gamed some in high school and college, but I never was a dedicated gamer, and I haven’t gamed in years. I enjoy gaming properties because of the world-building involved in them, and the story possibilities they present. When it came to the Dragonlance books you wrote, did you have to make any adjustments to your writing style to cater to a young adult audience? I wrote shorter, simpler sentences, shorter paragraphs, shorter chapters. All normal things you do when writing for kids. I also had to keep the level of violence down and keep the plot a bit more simple. The hardest thing was that in the Dragonlance setting, dragons are like Godzilla, and the editor insisted I have my young protagonists deal with a dragon during the story. I had to come up with a good reason why the dragon didn’t just kill my heroes with a single swipe of its claws! I managed to do it, but it wasn’t easy. Considering you've written tons of short stories and novels, in your opinion, how have you gotten better compared to, say, five years ago? What do you think is your strongest asset these days? My narrative voice is more assured, I think, and my prose smoother. I’ve become more versatile, too, since I’ve written fantasy, horror, science fiction, spy fiction, media tie-ins, etc. This versatility is probably my greatest asset. In general, the more versatile a writer can be, the greater the chances of his or her success. If you’re a one-trick pony you can be a success if you’re really, really good at the thing you do. Otherwise, the more tricks you know, the better. You also have a couple of e-Books available. How is the Internet changing the life of a writer and the publishing industry? There’s a lot of flux right now when it comes to e-publishing, with writers and publishers trying to figure out how to reach audience and make a living electronically. I think at the moment the biggest impact is the climate of uncertainty writers live in – as if this is anything new! Michael Stackpole is an example of a writer who’s been pioneering ways to create income streams from the Internet, and Douglas Clegg has used free e-serials to great advantage. Brian Keene uses his message board and general Internet presence to stay in contact with readers and draw new fans. Those are three great examples to look to in terms of the possibilities authors have when it comes to e-commerce. Did you ever feel there's a stigma against your writing, whether it's because you're writing genre, or you're writing media tie-in books? Sure, though there are plenty of people who think it’s cool that I write what I do. One of my colleagues read a story of mine and told me that it wasn’t exactly Hemingway, but then added “That’s not what you’re going for.” That kind of backhanded praise is more common than you might think. But mostly people have been enthusiastic and supportive of my writing. I’ve already mentioned how important persistence is. Always striving to grow, to be better today than you were yesterday is also vital. Being able to keep an open mind when it comes to feedback is also important – how else can you grow? These days, a lot of my students want to write because they love movies and comics. If you want to write prose fiction, you need to read prose fiction, a lot of it, all different types. You can’t beat the old-timers’ standard advice: read, read, read, and write, write, write. The second novel in the Nekropolis series – Dead Streets – will be out in later winter/early spring in the UK, just in time for the first novel to be released in North America. My Stargate SG1 , Valhalla, was just released, and the first volume in a new series from Wizards of the Coast called Lady Ruin will be out early in 2010. Thank you very much for the excellent interview. It was informative and I enjoyed learning more about Tim and his writing process, his books, and his advice. Thank you to Tim for sharing here today. This is a great interview --- I had read Nekropolis, courtesy of Angry Robot Books and LOVED it!! !